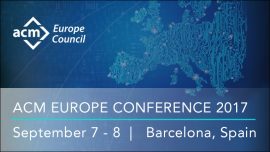 The ACM Europe Council will hold an international event from the 7th to the 8th of September 2017 in Barcelona. The event is hosted by the Barcelona Supercomputing Center (BSC). The ACM Europe Conference will be a truly international event, bringing together computer scientists and practitioners from around the world. Registration is free, but early registration is encouraged due to limited seating. The two main themes of the conference are Cybersecurity and High Performance Computing. A roster of leading researchers, practitioners and policy makers drawn from Europe and around the world, will examine the latest opportunities and challenges in this fast-changing field. The panel will be moderated by Chris Hankin, Imperial College, London. Panelists include Chris Hankin, Imperial College London (UK), Judith Gal-Ezer, Open University (Israel), Jeremy Epstein, National Science Foundation (US), Manel Medina, Politecnic University of Catalunya (Spain), and Gerhard Schimpf, chair of the Committee of European Chapter Leaders (Germany). 2012 Turing Laureate Silvio Micali is a visionary whose work has contributed to the mathematical foundations of cryptography and has advanced the theory of computation. His non-conventional thinking has fundamentally changed our understanding of basic notions such as randomness, secrets, proof, knowledge, collusion, and privacy. This foundational work was a key component in the development of the computer security industry, facilitated by his patents and start-up companies. His work has also had great impact on other research areas in computer science and mathematics. On 8th September, in the HPC track, Katherine Yelick will deliver a keynote lecture on applications of Exascale computing. Afterwards, an international panel of top experts including Mateo Valero, Paul Messina, Satoshi Matsuoka, Qian Depei, Alison Kennedy and Per Stenström will review progress and current plans for the worldwide roadmap toward exascale computing. The panel will be moderated by Thomas Skordas, Director for Digital Excellence and Science Infrastructure at the European Commission. ACM Europe Celebration of Women in Computing: WomENcourage 2017 is a scientific event, as well as an event aimed at networking and exploring career opportunities for women in computer science and related disciplines. EXDCI Final Conference 2017: The European Extreme Data & Computing Initiative’s (EXDCI) will include a co-located event within the Annual ACM Europe Conference 2017 that will take place from 7th September until 8th September 2017 in Barcelona, Spain. The idea is to organize a final conference jointly with the ACM Europe community that will gather HPC specialists, students and ACM members worldwide. On Thursday all attendees will be invited to attend the Turing Lecture and the Reception and ACM Fellow celebration, as well as the HPC track on Friday. On Friday morning, the EXDCI conference will include joint sessions with Eurolab4HPC and HiPEAC.